This BSD "Jersey Barrier Profile Mini" Front Hubguard fits perfectly on each side of your Profile "Mini" Front Hub and is simply inserted by replacing the cones of the hub. This two piece BSD "Jersey Barrier Profile Mini" Front Hubguard consists of a light weight aluminum core and a additional removable nylon cap which can be replaced with a new one when it is worn. 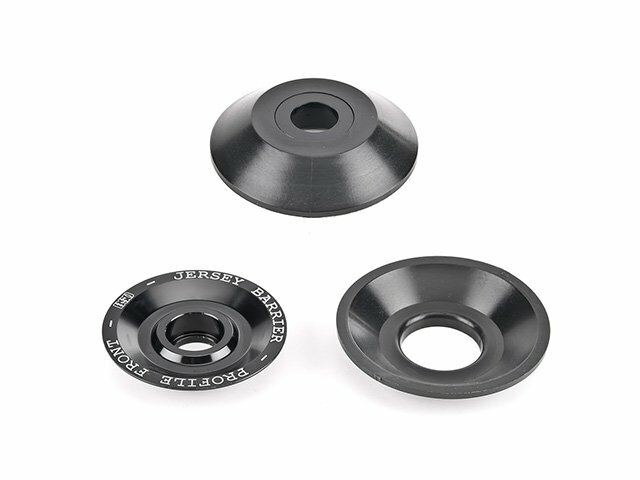 Plastic Hubguards offers low frictional resistance and high durability at low noise levels while grinding.